I have been processing some of my images and can decide which I like better, so I thought I would share the samples with you and let you tell me what you think. 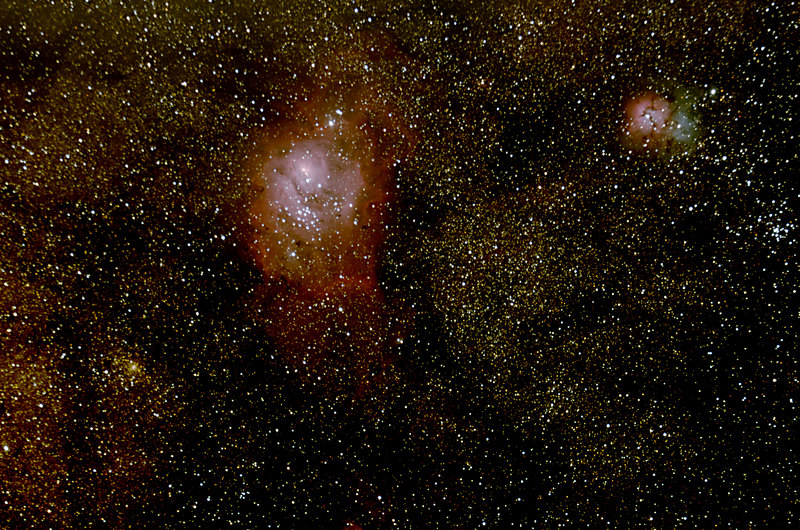 Both these images are of the Lagoon/Trifid nebula region, but have been processed in different manners. If you need help determining how best to protect your ideas, or know someone that can use my help, please contact me for a free 30 minute consultation at nvantreeck@usip.com or call TOLL FREE at 1-855-UR IDEAS (1-855-874-3327) and ask for Norman. Thanks for reading. Posted in Play and No Work. 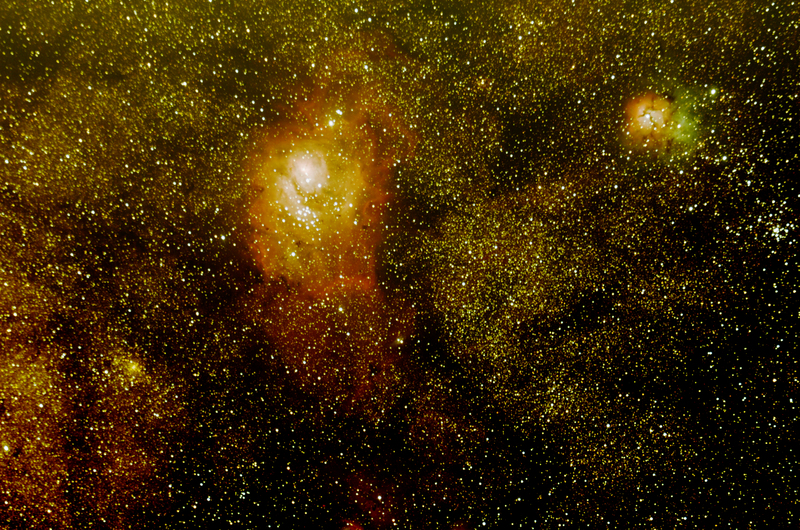 Tagged astronomy, astrophotography, Copyright, space. The SpaceX Dragon capsule has successfully landed back on Earth. This is the first commercial space vehicle to leave Earth and re-enter safely. A very bright future for commercial space exploration. Now to brush up on the legal ramifications that this is going to entail. If you need help determining how best to protect your new spacecraft or any other idea, or know someone that can use my help, please contact me for a free 30 minute consultation at nvantreeck@usip.com or call TOLL FREE at 1-855-UR IDEAS (1-855-874-3327) and ask for Norman. Thanks for reading. Posted in Play and No Work. Tagged astronomy, astrophotography, commercial space programs, Dragon, science, space exploration, spacex. The Patent Office will post what it considers to be the median income for the previous year on its web site. This will be welcome relief for those that qualify. As to the rest of the America Invents Act, it remains to be seen how it will play out. If you need help determining how best to protect your ideas, or know someone that can use my help, please contact me for a free 30 minute consultation at nvantreeck@usip.com or call TOLL FREE at 1-855-UR IDEAS (1-855-874-3327) and ask for Norman. Posted in Work and No Play. Tagged america invents act, business, economy, intellectual property, median household income, minute consultation, patenting, patents. I haven’t actually had time to process all my images yet, but I have recieved requests to post what I have. So, I created a Flickr account and will post them here. I have added some comments and geotagged the photos so you can see the area that the images were taken. The solar images (like the featured image) in the Annular Eclipse May 2012 set were taken with a point-and-shoot JVC Picsio camera through a cheap solar film viewer that was given to me. It worked surprisingly well. Friends of mine, Diane and Sandy from the Riverside Astronomical Society used this technique with their iPhone and Droid respectively and also managed to capture several good images of the eclipse. I hope you enjoy these and I promise to keep working on the other images. Posted in Play and No Work. Tagged astronomy, astrophotography, Eclipse, Solar eclipse, space, Sun, telescope. I’m not sure if “happy” is the appropriate term today as the purpose of the holiday is to honor America’s service men and women who are actively serving or have given everything to protect this nation. Happy is a relative term. I am happy that our country has a large group of individuals that are willing to place themselves in harms way so that no harm comes to others. I am happy that I can count myself as one of those people that served our country. I am extremely happy and grateful for the lessons I learned from my time in the service. The lack of mental health services for active duty and veterans, currently the suicide rates are the highest in history approximately 1 service member takes their own life every 36 hours. The lack of legal services available. I am a member of the Los Angeles County Bar Armed Forces Committee that was formed to combat this issue, but we are an island in a sea of need. Across this nation their are only a handful of count/state bar associations actively helping and identifying the needs of America’s military. If you know of a veteran or active duty member or family that needs help contact me (nvantreeck@usip.com) and I will send the request to those that can help. Most of our work is free or at a greatly reduced cost. It is our honor to provide this help. The less than adequate living conditions for military families. I, and many others, know that the families of active and veterans alike are also part of the military that serves this great nation. They should not be subjected to needing food stamps and poor living conditions to support our military efforts. There are a lot of other things that I am not “happy” about, but I (and others) are actively working to help where we can because our past and present armed forces personnel deserve better. So while you are enjoying your day off. Going to that Barbecue. Picnicking with family and friends. Remember the lives that were given and the sacrifices that were/are made so that you can live here. I’ll get off my soapbox now and I will have a happy memorial day. I hope your day is happy and safe. And, if you happen to see a Veteran or someone in the military, take the time to go up to them and thank them for today and all the other days that you get to enjoy. They WILL appreciate it. Posted in Uncategorized. Tagged Active Duty, Air Force, Armed Services, Army, Coast Guard, LACBA, law, legal, Marines, Military, Military Families, Navy, Veterans. I just got back from RTMC at Camp Oaks near Big Bear, California and I am a little tired. The altitude and the Sun after last weeks eclipse adventure have worn me out. 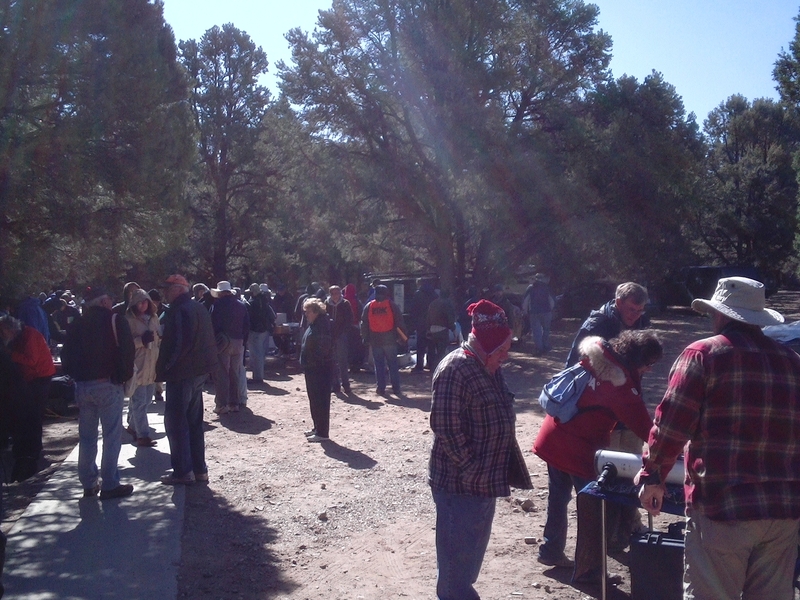 Saturday started out really cold with a dusting of snow, but it the temperature quickly rose with the sun and the annual yard sale was under way. Lots of things for sale and a lot of folks buying. I didn’t find anything used that I wanted, but I found plenty of new stuff that had my attention…like this lovely item from PlaneWave. A small trinket that I would love to have in my observatory. 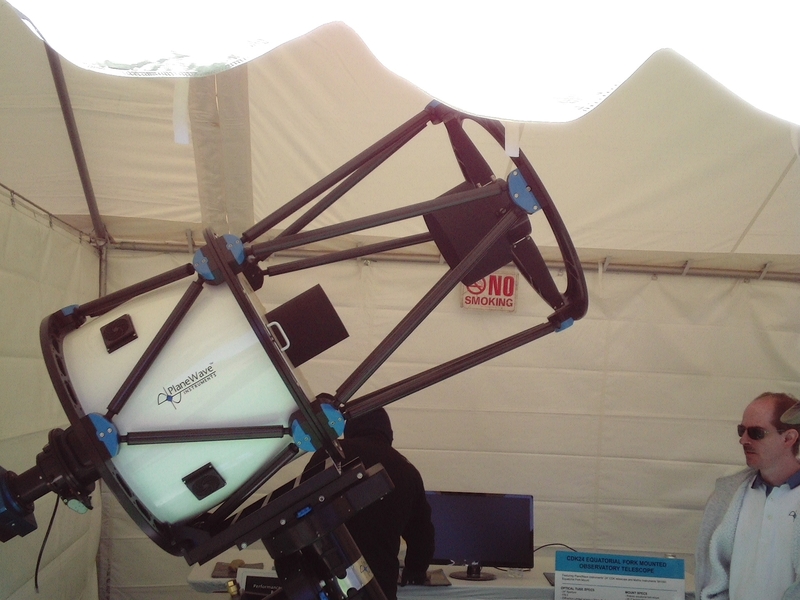 Below is a picture of my friend John from Televue, showing his wares. If you see John at a star party or an event like this, come back at night an take a look through some of the eyepieces and scopes that he brings with him. My club the Riverside Astronomical Society had a booth at the event. We are selling tickets to PATS at a reduced cost from the normal price. Other vendors will also have discounted ticket for sale. If you need an excuse to visit Pasadena in September, this would be it. I’ll post some more pictures the rest of this week. Posted in Play and No Work. Tagged astronomy, PATS, planewave, RTMC, telescope, telescopes, televue. I haven’t had time to process all the images, but here is the best “ring of fire” image that I captured with my Lunt 60mm solar scope. Let me know what you think. Posted in Play and No Work. Tagged annular eclipse, astronomy, astrophotography, Eclipse, science, solar, Solar eclipse, space, Sun. Congratulations to the folks over at SpaceX for their successful l Falcon 9 rocket launch. Later, the spacecraft will launch a Dragon spacecraft to orbit and (hopefully) dock with the International Space Station (ISS). SpaceX will be the first commercial company in history to attempt to send a spacecraft to the ISS. Can the images from 2001: A Space Odessy where a Pan American World Airways operated Orion III spacecraft with inflight service transports people to space on a regular basis be far away. I think Richard Branson already has plans. It is a great time for new frontiers. I look forward to it. Do you, or do you think that only governments should fly the friendly space skys? Posted in Play and No Work. Tagged 2001, iss, odessy, shuttle, space, space station, spacex. I’m leaving on a jet plane…well, actually in an RV for a remote spot in Utah on the center-line of the annular eclipse!!!! <Muppet flail> Yeah!!! </end Muppet flail>. I hope everything goes well and I will have some great pictures to share with you on my return. For those of you that have the chance to view the eclipse, please remember that this is NOT a total eclipse and that you will need to protect your eyes. Only 85% of the sun will be obscured by the Moon, leaving plenty of sunlight left to make you go blind. Take all precautions, especially with any children that may want to look up and see what is going on. I’ll be back on Tuesday! Posted in Play and No Work. Tagged annualr eclipse, annular, astronomy, astrophotography, Eclipse, Hubble Space Telescope, Moon, science, solar, Solar eclipse, Sun. You can find my very interesting radio show here at www.AdrenalineRadio.com and visit the Podcast – Now Playing section of the website. Be kind, this was our first time. I don’t think we did too bad considering the subject matter. Danton Mak, a partner at the firm and I did a one hour show this past week discussing intellectual property in general. However, if you have an idea that needs protecting, please contact me for your free 30 minute consultation at nvantreeck@usip.com or call TOLL FREE at 1-855-UR IDEAS (1-855-874-3327) and ask for Norman. Posted in Work and No Play. Tagged Copyright, intellectual property, internet, law, legal, patents, trade secret, trademark, trademarks, tradesecret.